Retailers respond to our campaign. Major retailers Countdown, Kathmandu and Noel Leeming are dropping 12-month expiry dates on their gift cards in response to our campaign. We launched our “Drop the Dates” campaign this month, which called on retailers to remove unfair expiry dates on gift cards. Our research found shoppers could be losing $10 million a year on cards that had expired before they could be redeemed. Consumer NZ chief executive Sue Chetwin welcomed the decision by Countdown, Kathmandu and Noel Leeming to drop their expiry dates. “It’s a great response from these stores and shows expiry dates can be ditched without causing problems. They’ve set an example that we want others to follow,” Ms Chetwin said. 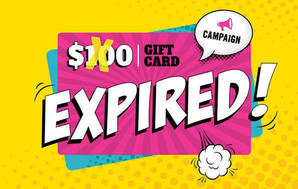 Consumer Trusted business Shoe Clinic has extended the expiry date to five years on gift cards bought from its stores. Two other retailers, New World and Toyworld, have extended the expiry dates on their gift cards from 12 to 24 months following our campaign. Of 10 major retailers we approached, three have declined to make any changes to their gift cards. Briscoes, Prezzy Card and Westfield Shopping Centres have said they’ll be retaining their 12-month expiry dates. Briscoes defended its 12-month expiry date, stating its practice was to honour any expired cards presented by customers. But Ms Chetwin said if that’s what happened, why didn’t the store just drop the expiry date? Other retailers approached by us include Ticketek, which only provides a six-month expiry date on its gift card, and Paper Plus. Paper Plus says its reviewing its position. Ticketek has yet to respond. Since the campaign launch, more than 5300 people have registered their support with us for an end to unfair expiry dates on gift cards. Our survey also found a majority supported change. Most respondents felt gift cards should have no expiry date or, if there was one, it should be at least five years. Other countries have regulations preventing retailers imposing unfair expiry dates. Most Canadian provinces have banned expiry dates. Gift cards in the US are required to have an expiry date of at least five years. Shoppers can register their support for change here. 77 percent of consumers regularly receive gift cards. $50 to $70 is the most common gift card value. 24 percent of gift card users are stuck with a card they can’t fully redeem because it’s expired or the store has gone out of business. 55 percent of shoppers unable to redeem a gift card had more than $20 still unspent. 50 percent of gift card users have experienced problems with their card including finding it hard to check the balance, only being able to use the card at a limited number of stores and struggling to find something to buy. OUR DATA are from an online survey of a nationally representative sample of 1029 New Zealanders aged 18 years and over. The margin of error is +/-3.06 percent. Ever been stuck with a gift card that expired before you could use it? Help us call on retailers to Drop the Dates by supporting our campaign.